How was everyone’s New Year Celebration? Mine was pretty quiet – I spent New Year’s Eve with my family eating lots and lots of food like we do everywhere (I’m not much of a party girl… I prefer to stay home… and eat! 🙂 ) We stayed up late eating (spinach dip, shrimp, stuffed mushrooms, bacon wrapped asparagus – my mom made all this from scratch! My amazing mom 🙂 ) and drinking Martinelli’s sparkling cider. Unfortunately, I had to get up early the next day to make sushi for our New Year’s celebration before we headed to my uncle’s house. You might remember me writing about this earlier, but if not, here’s a quick recap: Every year it is a tradition for us as a somewhat Japanese family to eat sushi on New Year’s. Typically, we buy all of our sushi, but this year, since the creation of SushiDay, it was a little different. We still bought California Rolls, Inari-Zushi and Futomaki (a vegetarian roll), but my family also requested that I make a few rolls. This roll is amazingly delicious! 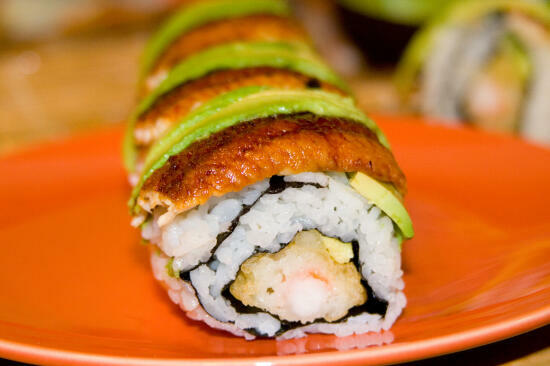 I love tempura shrimp, avocado, and unagi, and together they taste so good! In addition, the roll ends up looking very nice, so it seems even more mouth watering. 🙂 I’m really not sure how the roll got its name, and I have never before heard of the roll, but according to the Sushi Chart, this is another of the popular rolls (that nobody really knows about 😉 )! Bake tempura shrimp as directed on the package. (I haven’t had time to make homemade tempura shrimp so I can get you a good recipe for that… don’t worry, it will come as soon as I can try it!) You can also fry the tempura shrimp if you choose, but baking it is healthier, and you can prepare other things (such as the sumeshi) while it’s baking. Cut the avocados in half, discarding the pit. Slice the first avocado into thin sticks. Slice the second avocado into thin slices, although not so thin that they easily tear if you try to pick them up. Cut the cucumber into thin strips. Roll the sushi inside-out, using several avocado sticks, 2 pieces of tempura shrimp and a stick of cucumber as your fillings. 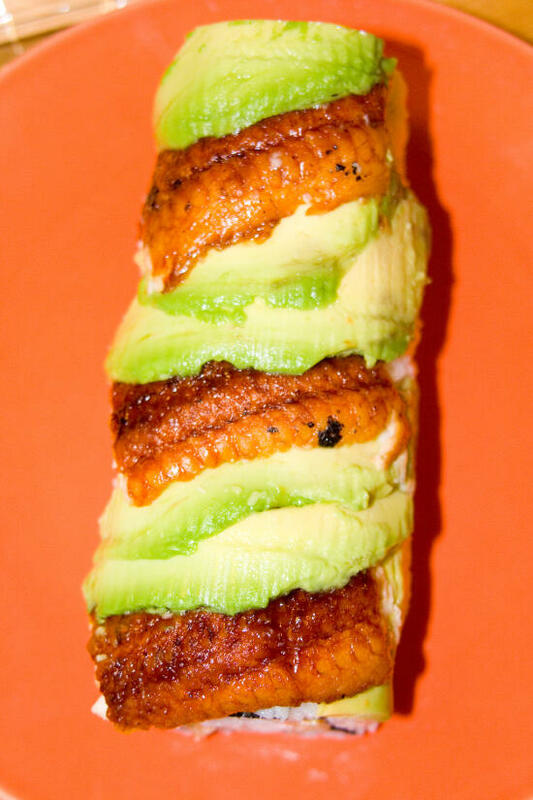 Lay alternating pieces of unagi and avocado on top of the inside-out roll. 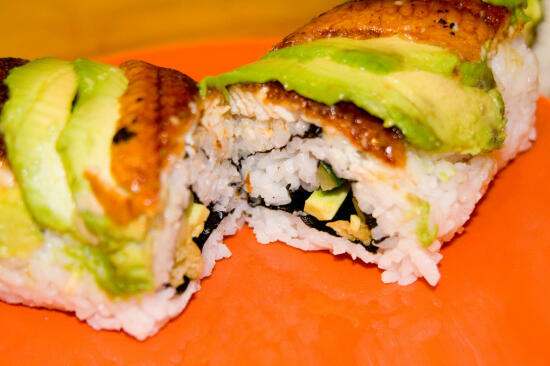 Use your plastic wrap-covered rolling mat to squeeze the unagi and avocado into the roll so they won’t fall off. Just stopping by to say how honored I am to be nominated in the same category with you, Madeline, Shauna, and Biggles. Congratulations and best wishes! 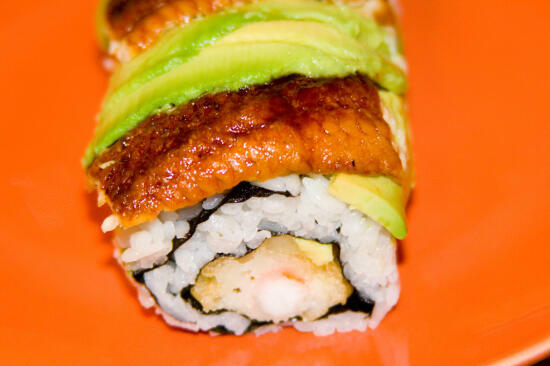 I recently hear that many people believe that unagi is an aphrodisiac! That might explain the name. But I also was told by a chef here in Osaka, that that rumour was started by a guy selling unagi in summer. It wasn’t known as a popular summer food and so his sales dropped every summer. Then he started marketing unagi as a food to make you stronger, and then that evolved into it being an aphrodisiac! I don’t know if this is true or not, but the chef is a very well known and well respected chef in Japan! BTW – this is the first time I have visited your site. Great looking pictures. I will be back now – as I have just subscribed. Thanks for the mini history lesson! It’s always interesting to find out how different sushi got their names. 🙂 Maybe I should start feeding Son more unagi! 😉 hehe just kidding!